The Perfectly Pumpkin Contest for the Ultimate Pumpkin Fun! I have a special treat for you on Monday. B-Inspired Mama (along with 10 other creative mamas) will be hosting tons of pumpkin fun with the first annual Perfectly Pumpkin Contest! You’ll be able to link up any pumpkin-related posts to enter to win in one of four categories: Kids Activities, Recipes, Pumpkin Carving/Decorating, and Crafts. Submissions will be open starting Monday, October 15th, through October 29th. Winners will be judged by some surprise guest judges and announced on Halloween. So get your pumpkin fun started, Mamas! I really like the pumpkins with the pain poured over the top, running donw. Love it! The Pumpkin Contest sounds like a ton of fun–I can’t wait to see what everyone’s been doing! 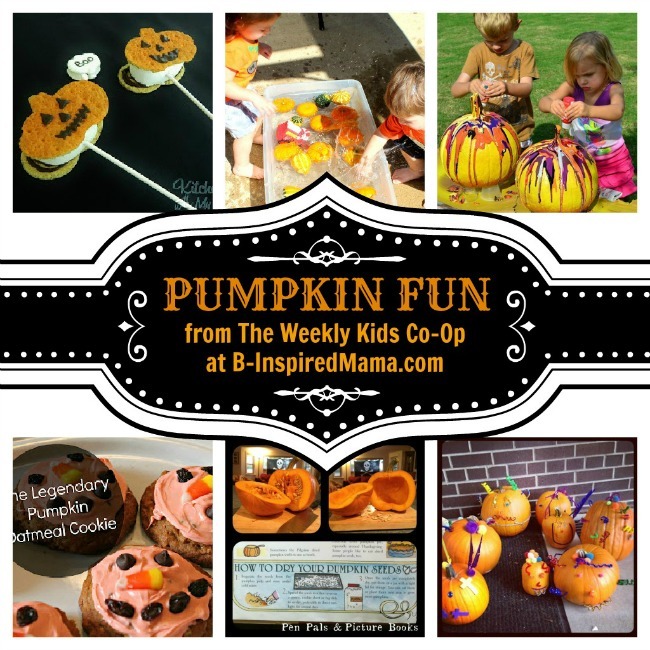 Thank you so much for featuring our fishing for pumpkins activity! We had so much fun that day and have done it several more times since then. I’m loving all these fun fall and Halloween ideas, and can’t wait for your perfectly pumpkin contest!